Aristides Vanis is working on his collection 'Trakatrouka' as a master's student at the London College of Fashion. And now he is looking for sponsors. 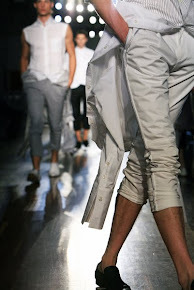 In april 2011 Aristides participated at the 13th Athens Fashion Week as fashion graduate of I.E.K. fashion school, do you remember his Karagiozis collection? But now in order to complete his master's collection he needs your help. His goal is to show what's more in today's menswear fashion. To achieve the best quality he is using digital print for the entire collection. Loungewear is a part of it, that's why he is using silk twill, silk viscose velvet and silk satin as well as cotton satin, cotton drill and cotton poplin for the rest of the collection. If you support him, he will give his entire sketches collection printed or selected previous prints or even a handmade print t-shirt from the Trakatrouka collection. And for the main sponsors he gives an invitation for the photo shooting in London or an invitation for the internal show. So help this young and upcoming fashion designer and make it happen for Aristides Vanis! Be part of his collection by contribute to his menswear collection ''TRAKATROUKA''. Follow this link for more information and to contribute to his campaign. If everybody who is reading this post and offering him the amount of a cup of coffee he can reach his goal!